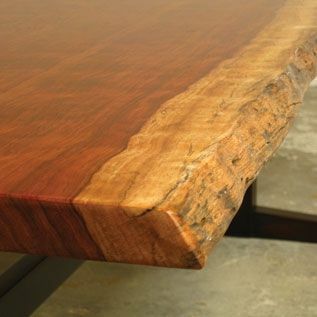 A little bit rustic, a little bit contemporary, our Russell natural (i.e "live") edge dining tables embody the form, spirit and craftsmanship of the late master woodworker George Nakashima. 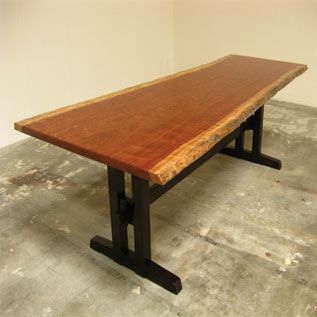 This table was inspired by Nakashima's Frenchman's Cove II dining table. 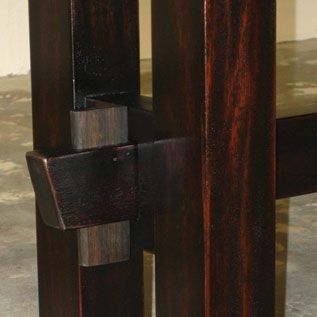 Pairs beautifully with our Nakashima-inspired Conoid chairs in same or contrasting wood species. 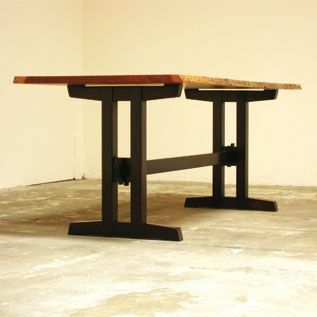 As shown: natural edge bubinga slab with ebonized mahogany trestle base and true ebony pins for assembly. Table top finished with satin sheen clear topcoat. Available in a wide range of domestic hardwoods and exotic wood species, choice of finishes and color treatments. Price varies accordingly. Dimensions: As shown: 96"L x 42"W x 29-1/2"H. Custom dimensions and shapes depending on available natural edge slabs.